Franklin, MA June 6, 2017 – Banner Environmental Services, an environmental services company headquartered in Massachusetts, announces their new Division of Capital Asset Management and Maintenance (DCAMM) certification for both asbestos abatement and demolition in Massachusetts. DCAMM, an agency within the Executive Office for Administration and Finance (A&F), is responsible for capital planning, major public building construction, facilities management, and real estate services for the Commonwealth of Massachusetts. Its Office of Contractor Certification certifies companies to bid on vertical construction projects by Massachusetts public agencies pursuant to M.G.L. Chapters 149, 149A and 25A. The certification process ensures an extensive pool of eligible and responsible bidders while simultaneously enhancing the competitive bidding process. 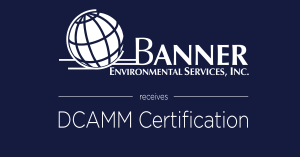 “The DCAMM certification, in addition to our recent WBE certification, are both significant to us and we look forward to the role they will play in our business opportunities moving forward,” added Stephanie Robl, Co-owner, Banner Environmental Services. Banner Environmental Services is a licensed asbestos contractor in Massachusetts and Rhode Island, with extended service to Martha’s Vineyard and Nantucket. In addition to asbestos testing, surveying, and abatement, the company also provides mold removal and remediation, black and gray water clean-up, complete and select demolition services, as well as vermiculite removal. Their environmental services are offered for residential, commercial, and institutional projects. For more information on Banner Environmental Services, visit bannerenvironmental.com. With over 25 years of environmental experience, Banner Environmental Services, Inc., both a WBE and DCAMM certified company, focuses on the mission of promoting positive change for their customers, the community, and the environment. Banner Environmental Services is fully-licensed in Massachusetts and Rhode Island, covering the Greater Boston area and including Cape Cod and the Islands. For more information, including comprehensive services provided, visit bannerenvironmental.com. 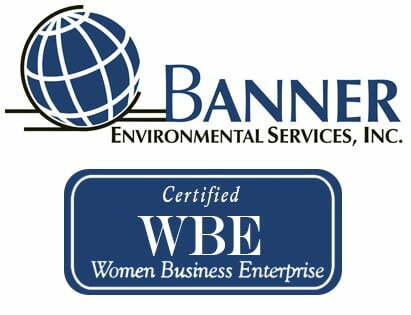 Franklin, MA May 15, 2017 – Banner Environmental Services, an environmental services company headquartered in Massachusetts, announced today they have received Women Business Enterprise (WBE) certification. The WBE certification is the result of an extensive process and on-site interview by the Supplier Diversity Office (SDO) to determine that the company meets the state statutes and regulations and is at least 51% women-owned. Certification and access to the various phases of state purchasing and contracting provides a valuable service to WBEs, which are the state’s fastest growing business sector. By partnering with companies that are WBE-certified, corporations, non-profit organizations, and government agencies can demonstrate their commitment to supporting and strengthening diversity. With over 25 years of environmental experience, Banner Environmental Services, Inc., focuses on our mission promoting positive change for our clients, the community, and the environment. Banner Environmental Services is fully-licensed in Massachusetts and Rhode Island, covering the Greater Boston area and including Cape Cod and the Islands. For more information, including comprehensive services provided, visit bannerenvironmental.com. 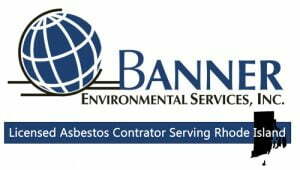 Franklin, MA November 2, 2017 – Banner Environmental Services, headquartered in Massachusetts, has obtained an asbestos contractor license in the state of Rhode Island, expanding their service area. Rhode Island, like most states, requires that any asbestos work – whether surveying, testing, remediating, or removing – be handled by an official licensed asbestos contractor. Licenses are bestowed per each state’s rules and regulations annually to qualified contractors in good standing. Banner Environmental Services also possesses a Massachusetts asbestos contractor license, providing such services throughout the entire state including Cape Cod, Martha’s Vineyard, and Nantucket. In addition to asbestos abatement services, the company also provides mold removal and remediation, black and gray water clean-up, complete and select demolition services, as well as vermiculite removal. All their environmental services are offered for residential, commercial, and institutional projects. “Our team of trained professionals are committed to our company’s mission of promoting positive change for our clients, the community, and the environment and this expansion is a testament to that,” added Stephen Wenzel, Co-owner, Banner Environmental Services. For more information on Banner Environmental Services and the complete list of services they offer, visit: bannerenvironmental.com. With over 25 years of environmental experience, Banner Environmental Services, Inc., focuses on our mission promoting positive change for our clients, the community, and the environment. Banner Environmental Services is fully-licensed in Massachusetts and Rhode Island, covering the Greater Boston area and including Cape Cod, Martha’s Vineyard, and Nantucket. For more information, including comprehensive services provided, visit bannerenvironmental.com.